Big Brothers Big Sisters of Shelby & Darke County’s 13th annual Duck Derby & Duck-N-Run 5K will be June 20 at Tawawa Park in Sidney. 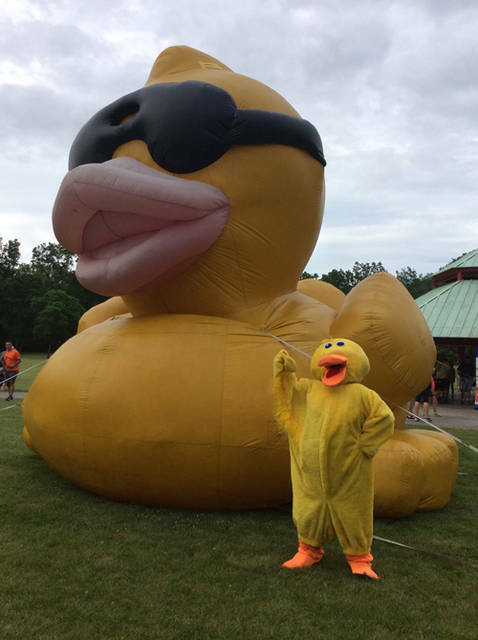 SIDNEY – Big Brothers Big Sisters of Shelby & Darke County’s 13th annual Duck Derby & Duck-N-Run 5K is coming up on June 20 at Tawawa Park in Sidney. This fundraiser is open to the public, and individuals and businesses are encouraged to participate. This annual event is a way to support children within the local communities. By “adopting” a Duck Derby rubber duck for $5 each or six for $25, participants not only have a chance to win the $1,000 cash grand prize and 12 other prize packages but they will have a positive effect, supporting mentoring programs. New this year is the opportunity to adopt Defender of Potential Ducks for $25 each. The Defender of Potential Duck drawing is limited to only 250 tickets, offers better odds of winning, and one person will be the winner of a $500 cash jackpot. The Defender of Potential Duck winner will be drawn at 7:30 p.m. with the regular Duck Derby immediately following in Tawawa Park’s Mosquito Creek. This year’s prizes include the $1,000 cash grand prize; two Country Concert tickets compliments of Meyer’s Garage & Drive Thru; amusement park tickets compliments of Cedar Point and Kings Island; baseball tickets compliments of Cincinnati Reds, University of Cincinnati, Akron Rubber Ducks and Lake County Captains; and many more prize packages that are listed on the agency’s website. The Duck-N-Run 5K is part of the Shelby County 5K Tour. Pre-registration for the 5K must be received by June 10. On the day of the event, 5K registration will begin at 7 p.m. at Tawawa Park’s Geib Pavilion, and the evening race is set to start at 8:15 p.m. Various sponsorship opportunities are available and range from $200 to $750. Door prize donations and general monetary gifts are appreciated as well. Anyone who is interested in sponsorship opportunities should contact the Big Brothers Big Sisters office prior to June 10. A Big Brothers Big Sisters representative will offer duck adoptions and 5K registrations to the public during the Great Sidney Farmers’ Market starting May 25 and Greenville Farmers’ Market starting June 1. Individuals also can adopt ducks from Meyer’s Garage & Drive Thru in Newport, board members, local community festivals and the agency office located at 121 E. North St. in Sidney. For a complete listing of prize packages, sponsorship opportunities, online duck adoptions, online 5K registrations and more information, go to www.bigbrobigsis-shelbydarke.org or call 937-492-7611 or 937-547-9622. Big Brothers Big Sisters of Shelby & Darke County is a non-profit United Way member agency. Proceeds from the event will benefit the local Big Brothers Big Sisters agency, which matches at-risk children with volunteer role models. These volunteers are screened and meet with children at least two times per month offering guidance, support and positive role-modeling. The concept of services by Big Brothers Big Sisters is to get community members to open up their lives to a young child within their own community. It does not take a great deal of time, money or talent; the volunteers just need to care about children. Community members who don’t want to make a commitment of volunteering can help the agency in other ways. The agency is always looking for cost-saving ideas for activities that volunteers can do with their matched Littles. In the past, companies and individuals have donated tickets to local events, sporting events or hosted a special outing for the Big Brothers Big Sisters group.